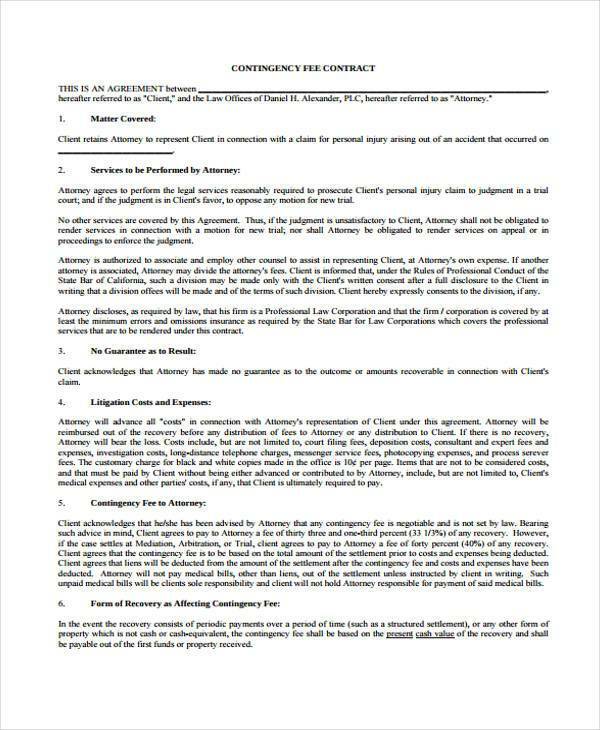 A contingency fee or a conditional fee is an amount of money which will only be given as payment to the attorney if the party availing of that attorney’s services has won the court’s decision. 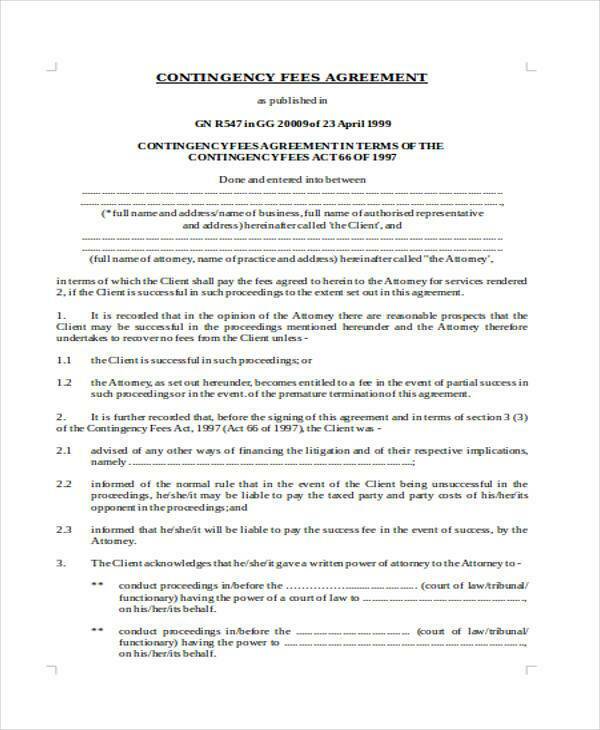 In transacting the fee, a Contingency Fee Agreement Form is needed for legal and documentary purposes. The client and the attorney will agree to the percentage they will acquire upon winning the case’s awards. Terms and conditions will fully depend on what the parties will agree. Whatever the agreed matters between the attorney and the client are, they should always base the legality of the agreement on their state’s rules and regulations. Ask some legal advice. It all starts with an attorney as your mentor. If you are a client, don’t be hesitant to inquire about the attorney’s fees, terms and conditions, and how he will present your case in the court. If you are an attorney, ask some advice from your colleagues whenever you are in doubt of your client’s suggestions and demands. Be aware of your state’s rules and regulations. Nobody wants to end up changing the agreement’s content just because a part of it has violated the rules of the jurisdiction, right? Always put in mind what the state’s law says in terms of dealing with the fees. Some jurisdictions do not allow having a contingency fee while some encourages clients to give an award for their winning lawyers. Know the opposite party. Trust can only be built if you know each other well. In terms of a new client and a lawyer, there is not enough time to establish a strong relationship; therefore, knowing each other’s background and achievements will help in facilitating efficient communication. Understand the case. A lawyer does not only accept a case just for financial purposes, he should read and give his full attention to be able to understand it. 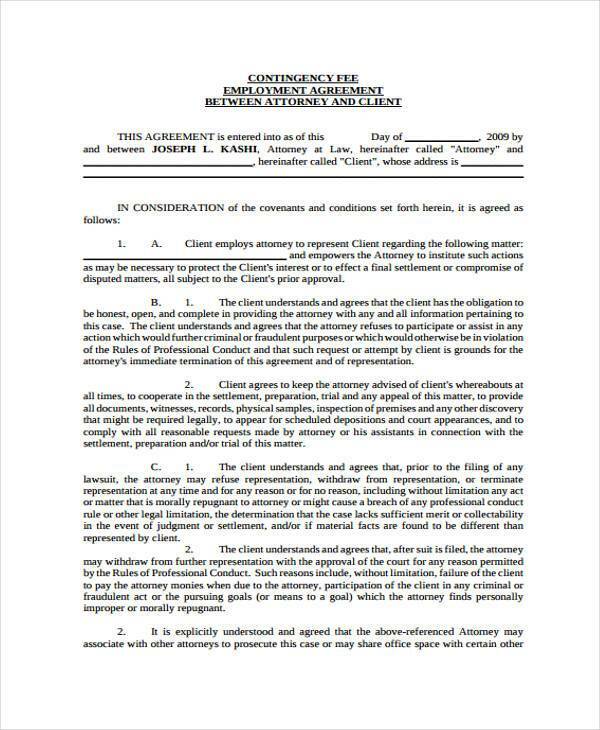 In knowing the details, an agreement – sometimes even a Business Agreement Form, because of the professional nature of the relationship – will be formed and the terms will be written with the consent of both parties. 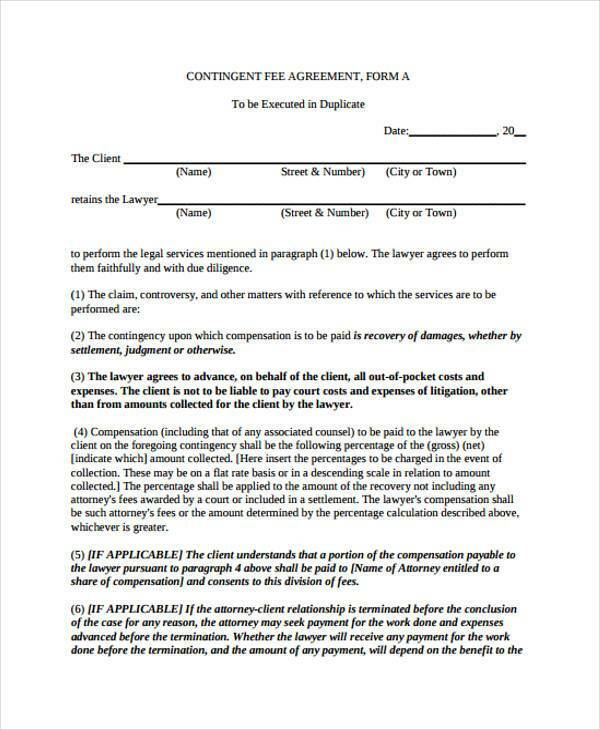 The Contingency Agreement Form will serve as a legal document that proves the agreed terms between the client and the lawyer. 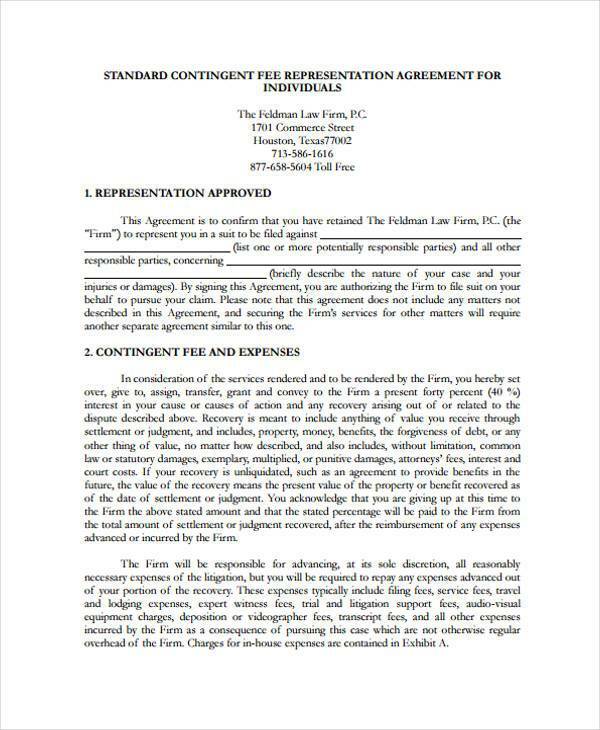 The form will be a reminder for the lawyer in giving and presenting his best pitch in the court, which means that the agreement is a huge motivator for both parties. 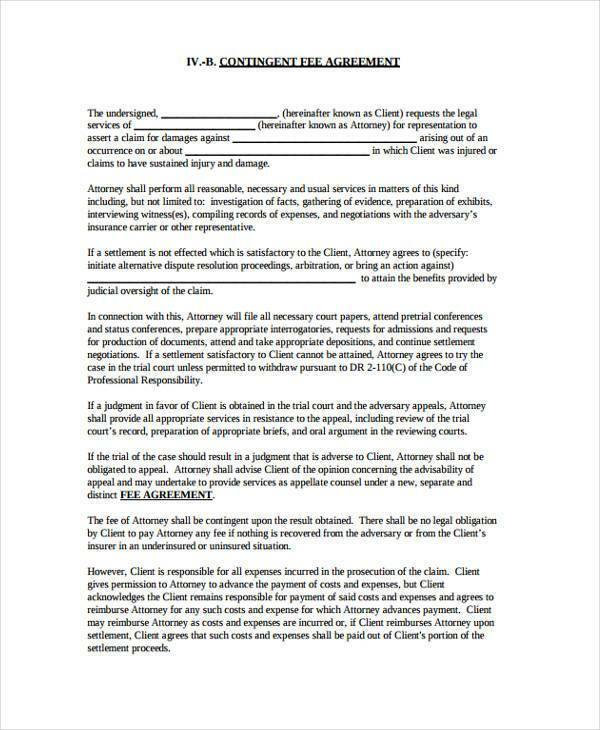 The agreement should also include how the client shall pay the attorney: if it will be through installment basis or by giving a full fee payment. 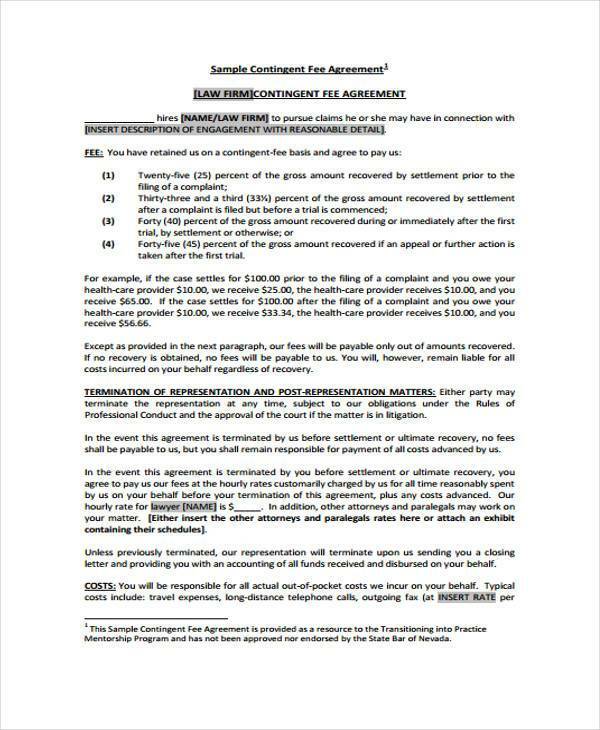 Why Use Our Sample Contingency Agreement Forms? Our sample forms are downloadable in your desired format, either in .doc or .pdf formats. There are also a variety of choices, from simple to intricately detailed texts, that you can choose from. 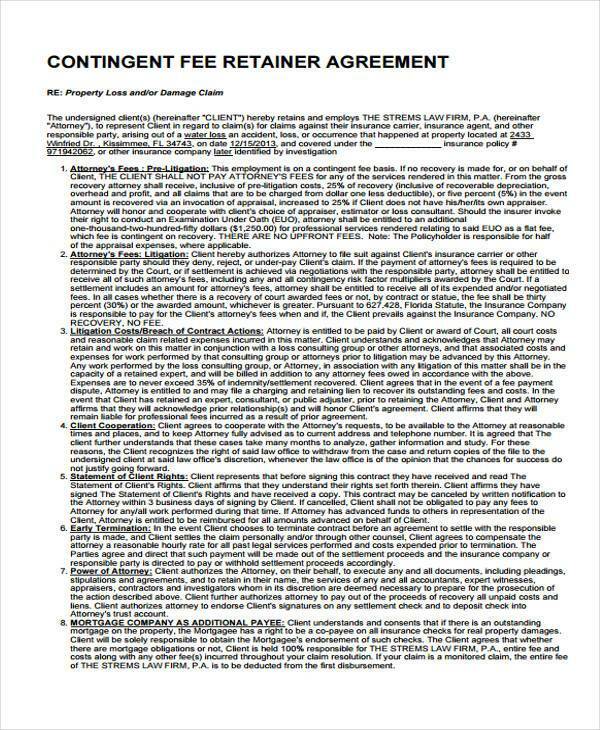 We have a standard Contingency Agreement Form that every individual can simply fill up with appropriate and correct information. We also offer different kinds of legal documents on our website, from affidavits to Residential Agreement Forms. With this, we assure you that our forms are applicable to use in court sessions and as personal references, and are editable to fit your needs.